Perfect for making lips and eye brows semi-transparent and much more life-like. Will also make your paints spread smoothly like satin. 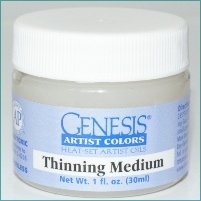 Thinning Medium looks like a clear Genesis paint but it is much, much more. It is hard to get a semi-transparent lip color using odorless thinner because it pools and puddles in lip lines and the crevices of the mouth. Thinning Medium makes your lip color spread out nicely and gives your baby's lips that translucent life-like look that everyone expects from your work. Thinning Medium also helps you make delicate hair-like eyebrows quicker than ever as it thins the paint without making it runny. Thinning Medium will not water down the paint - it just makes it easier to use and spread - giving you more control over your brush strokes which means more life-like babies!